My husband is so resourceful. For lights on the boat, he used a pair of used headlights from a truck. Of course, we had the red and green lights on the bow as required by law, and a white one on the rear, what I am talking about are lights that shine down onto the ocean floor so you can see the lobsters roaming around. His resourcefulness also came in handy when it came to preparing our meals. Grilling is a given, and frying fish on the grill takes some talent. 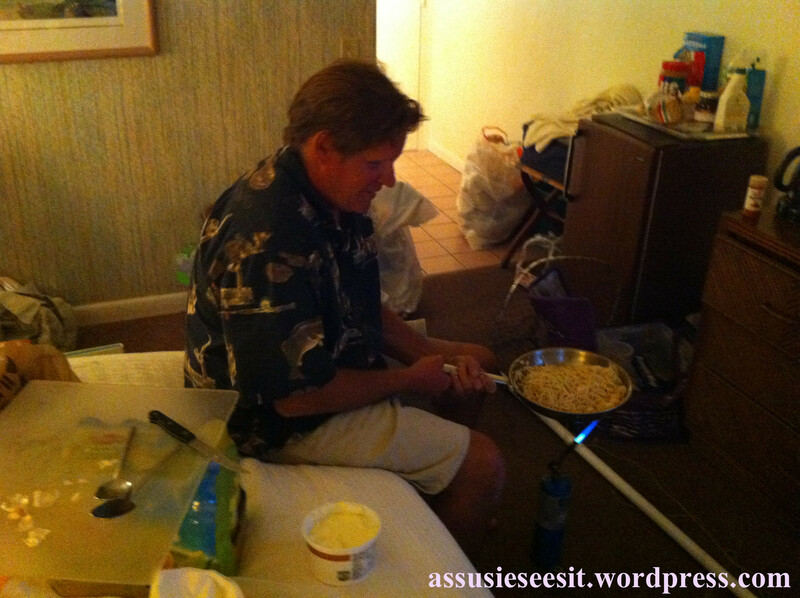 Some nights we did not want to grill, so he heated up food we brought from home with a blow torch. We boiled water for hot dogs, heated cans of soup, and even cooked scallops in a skillet. We also consumed a lot of beef jerky, dried fruit and nuts that week. I believe we ate healthier and cheaper than we normally do at home. 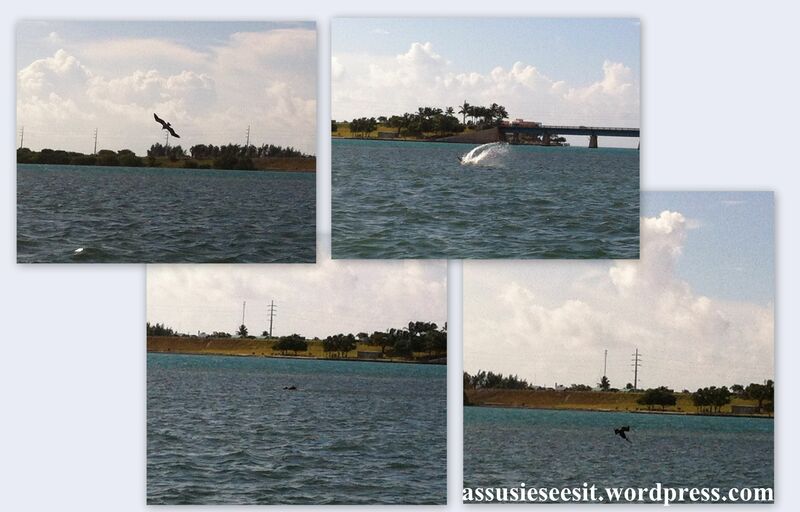 An amazing event that took place right in front of me, over and over, was a bird diving into the water. It really was very cool! 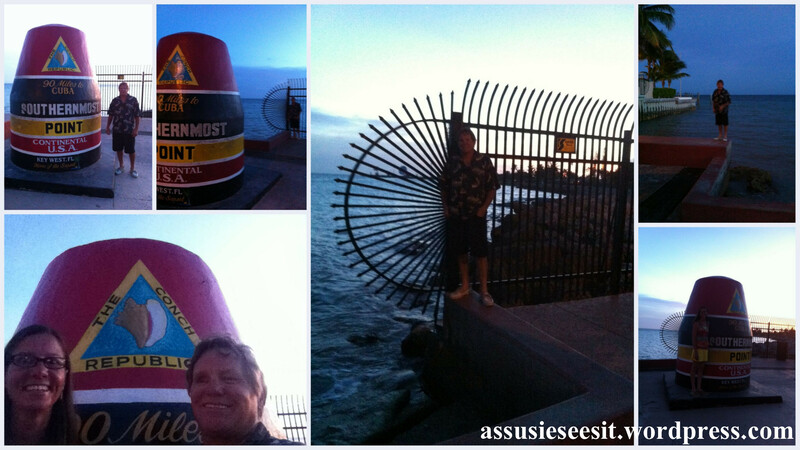 Friday night we drove down to Key West and visited the “Southern Most Point” where Dave pointed out that the “monument” was clearly not on the southern most point. We split a banana split at the Southern Most Denny’s then walked it off by checking out all the art galleries on Duval Street. We did not realize that there are so many! We watched the town come alive at nine o’clock, almost at once, as we made our way up and down the main strip. We lingered in the Sperry store, marveling at the huge selection. The hammock store caught our attention for a while as well. We walked by Hemingway’s House and the Lighthouse Museum and watched the streets shut down like a light switch promptly at eleven. It was a little strange until we realized that the stores close at eleven, so there would be nothing to do unless you were hanging out in a bar, and that must be where everyone was. But it was like a ghost town out on Duval Street, so we headed back to our room, enjoying good conversation with each other on the hour-long drive back. One particular conversation was when we saw flashing lights from a police car that had someone pulled over. As we passed it by, my husband jokingly said, “No officer, I haven’t been drinking… I may not pass the field sobriety test, but give me a breathalyzer, really, I haven’t been drinking!” As the driver, I pondered my ability in a field sobriety test and we had a good laugh about it. Irony. You see, after four consecutive days of spending 10 hours each day on a small boat, drifting most of the time while we fished, we had what I call “the waves” going on. Sitting still, like at Denny’s, it felt like we were still on the boat. The room was wavy. It was weird. Driving, for me, was fine for me though, as long as we were moving. Bedtime was a different story. Lying there feeling the motion of the waves reminded me of having the spins back in the day, which made it difficult for me to sleep. But it was all good. And life is good!